Now Touring: Victoria Findlay Wolfe & Sizzix Blog Hop! If you have read the latest issue, you may have seen my article in which I discuss being diagnosed with Sjogren’s Syndrome. 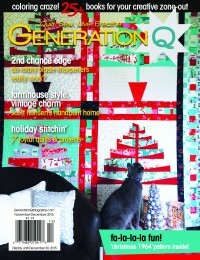 It will be two years since my diagnosis on January 24 and a lot has changed with my quilting in that time. 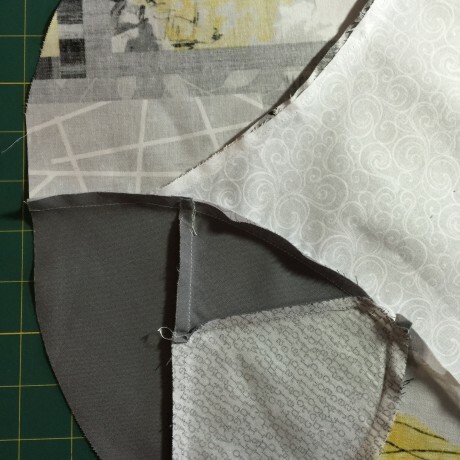 My precision is not what it used to be and there are certain days where my foggy head and imperfect hands make it difficult to cut fabric, let alone sew it back together. I have known Victoria Findlay Wolfe for a few years now and in that time I have felt a bit envious of her prolific quilting. Let’s face it, the girl can whip out a quilt in a week or less! And well, when you find it difficult to sew precise seams, you can feel a bit jealous. In my article Sewing Forth and/or 25 Tools and Strategies for Adaptive Sewing, you will learn about the tips and tools that have helped not only me, but my friends in their quest for better (and more body-friendly) sewing. Towards the end of 2014, I decided that I wanted to make sewing more a priority and Victoria has been my inspiration. So when my friend Linda Nitzen at Sizzix asked if I wanted to try out Victoria’s new dies, I jumped. I already have the Big Shot Pro and the Sizzix Double Wedding Ring die, so I got the Full Melon and the Tulip dies to coordinate. You need the DWR die to use Victoria’s dies which add a layer of versatility and the ability to improve. 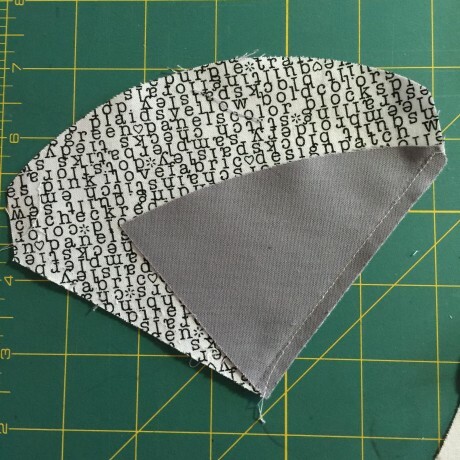 What I love about my Sizzix Big Shot Pro is that it gives me the ability to cut a ton of fabric in minutes, no matter how my hands are feeling. I just finished my first quilt of the year, which was about twin size and it took about two minutes to cut all of the strips for the binding. Another side bonus is that my Sizzix Big Shot Pro also can take Accuquilt dies with an adapter, so if you are on the fence about brands… well, the Big Shot Pro takes Accuquilt but the Accuquilt can’t take Sizzix dies. I love using Victoria’s 15 minutes of play techniques to make fabric, but this time I had some Benartex Cosmopolitan fabric that features a pieced look that I thought might be fun to use. The dies are simple to use and I was able to use a 10 inch square on the melon, I just needed to line it up right. What I love about the tulip die is how easy it is to line up the unusual shapes for perfect piecing. …anyone can! Sizzix dies allow me to cut out a quilt block in minutes and the notched edges help me line it up for perfect results every time. Quilting this block was tons of fun too. I used a walking foot on my BERNINA 780 using the 97D foot and after stitching in the ditch using Aurifil 50 wt, I echo quilted the center. I LOVE the little twist in the middle I got from varying my echo. With such a swirly center, I decided to go more geometric on the melons, though I did keep some curves. I made this block with plans to make a table topper, but I am afraid I may have caught the DWR bug. This was so much fun to make! I really love curved piecing and Victoria’s innovative designs offer a ton of possibility. And it sews together so quickly, maybe there is hope of me becoming “prolific!” I think I have a full quilt in my future. On to the giveaway…. Sizzix is giving away an AH-mazing package. The winner gets the Big Shot Pro and Victoria’s three dies. Good Luck! Please visit the other stops along the Sizzix Hop for more chances to win! OMG What an awesome post! I also love checking out what Victoria Findlay Wolfe is doing. She is so prolific! I can only dream of making a quilt a week! Would love a new quilt toy!!! !None of my group has entered this world of cutting fabric so this could be the start of something very fun!!! 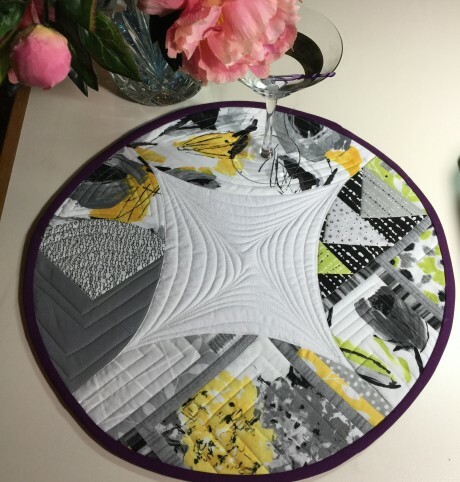 Love your table topper – thanks for sharing and thanks for the chance to win. I didn’t quite understand the box about the giveaway, so I’m commenting this way to be sure I’m in the hat, please. You make it sound like a great idea for me, too. Thanks for the opportunity. Hi Yarngoddess! Please use the Rafflecopter to enter as we aren’t hosting this giveaway. Click on the link to log in via Facebook or enter your email (this is how they tell you that you are the winner) and then you will have several ways to earn entries. What swirly quilting! I need to do more of this type of quilting. I usually only do straight line quilting. This looks like so much more fun! Beautiful finish! You can do it too! I did only “straight line” quilting with a walking foot on this. The 97d foot is like a walking foot in that it has dual-feed attachment. The swirl appeared because as I was ech quilting, I swerved wide at the start of each arch – the swirl showed up like magic. Try it! I have been using the Fabi dies to cut my shapes for quilt tops as I own a Big Shot. I have made four quilts with these dies so far. The Big Shot Pro dies look to offer much more versatility! Your circular project was awesome and your quilting superb! I would love to own a Big Shot Pro! Thank you so very much for sharing your talents. Wow! I love your piece! Thanks for sharing! Love that little quilt – the dies make it look so easy!! 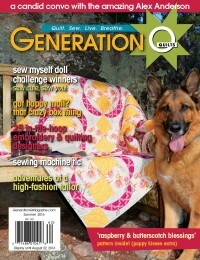 I never knew that the Pro can take Accuquilt dies! Where do you get the adapter? The Sizzix dies are awesome but it is great that there is a choice to use something else too without having to buy another machine. Your table topper came out fantastic! I would love to win this prize. It is getting harder and harder to cut stuff out. Thanks for the chance to win. I love your tabletopper!! Very unique, and the colors….!! 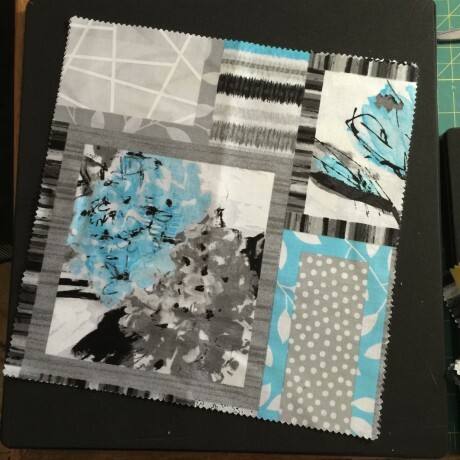 Thanks Tracey for sharing your story w/us and finding new ways to continue quilting. Just gorgeous! Love the stitching, the design and the colors! 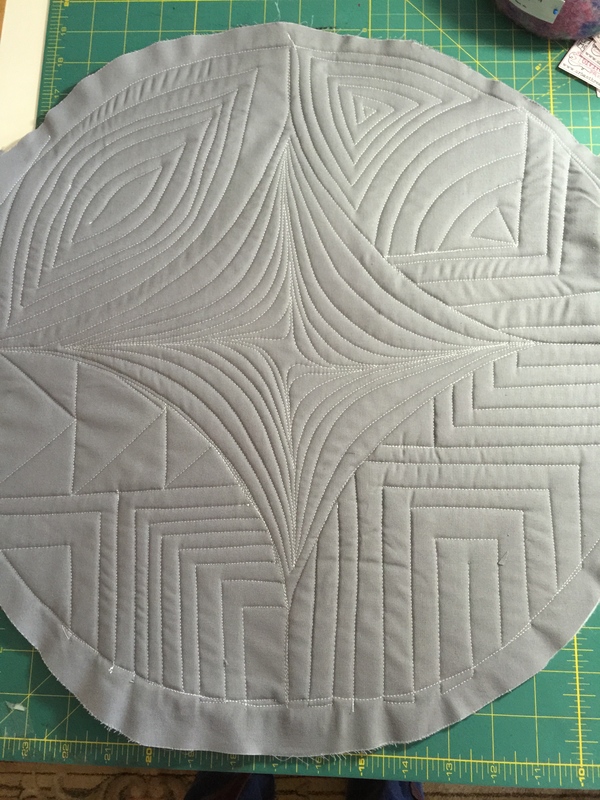 Love Victoria’s quilts and love these big dies! And I can use my Accuquilt dies! What could be better!! Oh I love this block and the colors you chose, thank you for sharing. Have an awesome day! I have been wanting a Sizzix for a long time. I would not have thought to combine grey and yellow. I will keep that combination in mind when I make my next baby quilt. I like to have them on hand so when I hear about a new birth I have a quilt ready. The only one I have at the moment is yellow and green. Love your table topper. I have yet to get a Sizzix, so I would love to win! The double wedding ring has been my favorite quilt design since I was a young girl!!! Thank you for such a wonderful giveaway!! This would be such a blessing as arthritis is making cutting out my quilts very difficult! Great hop! 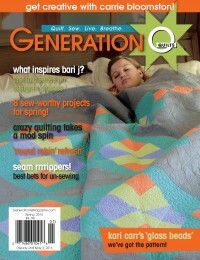 would like to try a quilt! This is beautiful! And thank you for sharing about your challenges with sewing. I have fibromyalgia and find sewing challenging at times as well. But I love it and have found some ways to make it a little easier for me. I have never seen anyone address this. 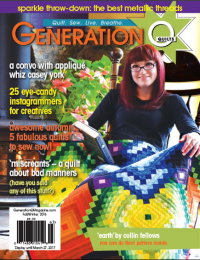 I would love to read your articles about adaptive sewing and sewing forth. Can you tell me where I can find them? Thank you! This is such a clever use of the die! I love what you did with it. The combination of the printed fabric “blocks” and the curved piecing and quilting is gorgeous! Thanks for the well done step-by-step as well! To be creative is a joy. Fabulous project! thank you for sharing! I love the little round table topper! Beatiful! I love your style. Winning looks like the beginning of lots of fun and creativity. I’ve heard so many good things about Sizzix, I’d love to give it a try! This is a dream machine!! Would love to win- thanks so much for sharing! Inspirational project. Fun design that I would love to make. I love what you did – the table mat is beautiful! Love your DWR piece! 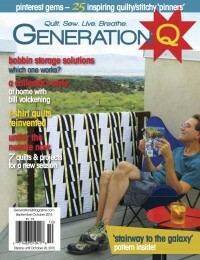 I have bought Generation Q mag before (I live in New Zealand) and will certainly be looking out for your new edition. I too have Sjogrens Syndrome, diagnosed many years ago so I know just where you are coming from! 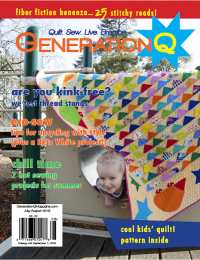 I look forward to reading your article and happy quilting! Fist bump sistah – Thanks for the shout out! Us Sjogren’s survivors understand all too well don’t wee. I would love to hear what you think about the articles! I’m looking forward to making the table topper. Beautiful quilting! I must say, your work is gorgeous despite your health challenges. Blessings! Swoon! You made my day! Thanks for the fun!! Cool project!!!!!!! I love my SIZZIX BIG SHOT. Would love the pro. Super cute! Love the quilting in the center. Love your use of design and color to get a wonderful result. Would love to win this amazing prize! Would certainly brighten my day. 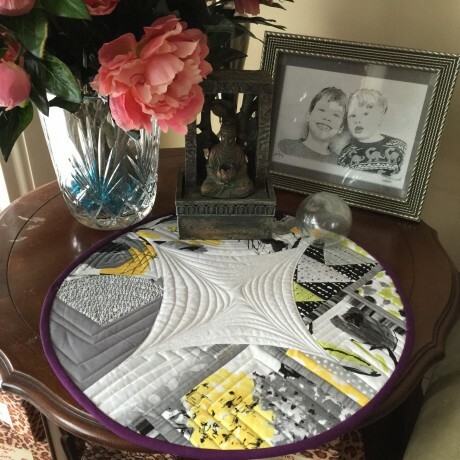 Love your table topper and information about the Sizzix Big Shot! this looks like amazing fun to me. Your use of zipper trim is very striking. What a lovely project you made! I’ve been wanting one of these, thanks for sharing the beautiful project.